Dio was the very definition of metal, one of the genre’s founding fathers, and his loss to stomach cancer last year was a real blow. Thankfully, his music lives on, and his timeless solo material especially deserves more attention that it gets. As brilliant as Holy Diver is (and it is, indeed, very brilliant indeed) it can sometimes seem as though it’s a bit too well-loved. It’s praised to the skies by virtually everyone, from mainstream metal toe-dippers to the deepest and darkest parts of the underground, and the rest of his output is more or less ignored in comparison, despite being pretty damn good in its own right. 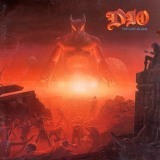 Take The Last In Line as an example, Dio’s second solo album, coming barely a year after Holy Diver and with more or less the same lineup, the only change being the addition of keyboardist Claude Schnell. It’s easily up there with the debut in terms of quality, if you ask me, a metal classic that has avoided recognition only due to the vast shadow its predecessor casts. I defy anyone to listen to fantastic opener We Rock and not be caught up in its euphoric whirlwind – it’s that sort of instant metal anthem that power metal tries so hard to reproduce these days, and mostly fails. Failure is not a term you can apply to The Last In Line, by any means. The title track manages to one-up We Rock with a slow and melodic beginning before launching into metal crunch, reproducing and topping the chorus of its predecessor as a gloriously anthemic performance from RJD himself. Vivian Campbell deserves a word, his riffs and solos providing the perfect backing to that voice, and the rest of the band do themselves proud, too. It’s often declared to be Dio’s best song, and it’s certainly in the running at the very least. Breathless’ fast-paced stomp proves that the rest of the album isn’t lagging far behind, before I Speed At Night comes in and joyously takes you for a spin, the band gleefully playing with tempos as One Night In The City slows things down for a real blast. It’s hard to find fault here at all, even mid-album pieces like Evil Eyes being rather awesome in their own right. Even the use of keyboards is pleasing rather than annoying, the melodic touches given to the likes of Mystery (probably the weakest track present, if I had to choose) enjoyable. Fear not, as there are few keyboards around – it’s all about the guitars, Campbell’s contribution saving Eat Your Heart Out from dipping into lyrical glam rock semi-misogyny. As for finale Egypt (The Chains Are On), well, it’s an epic of epics, a glorious finale to any album worth its salt but the crowning cherry on this marvellous piece. Those with eyes will note that I’ve rather glossed over the actual details of the songs, and rightly so. The sheer exhilarating effect that RJD’s voice can have is best experienced in person rather than restricted in cold words – all you need to know is that The Last In Line is a killer album full of fantastic songs that more than follows up Holy Diver in style. As a call to arms, few things can top the first track... wherever RJD is, you know he’s sailing on, singing his song, carrying on, ‘cause he rocks; and so does his music. The Last In Line deserves your ears and your heart, without a doubt.